Tears spilled down her cheeks as she stroked the warm, soft, brown coat and gazed into loving eyes. For the first time since arriving in Stillwater, Alex Miller felt a little piece of home. The crowded and chaotic Student Union intimidated the freshman, but she couldn't ignore the small voice saying, "Go inside." As she entered, she noticed two dogs wearing service-animal vests. Thinking of her own dogs in Texas, Miller asked if she could pet them. A very friendly and excited therapy dog in training named Charlie greeted the 18-year-old. In that moment, amongst a sea of strangers, her loneliness and homesickness faded away. "Charlie was licking me and being so adorable," says Miller, who plays trumpet in the Cowboy Marching Band. "It lifted the rest of my day and definitely made me look forward to going home and seeing my own dogs." The Keller, Texas, native expressed the hardships a new student faces on campus, especially coming from out of state. For the psychology and music education major, being unable to drive home on weekends to see her family and pets is a struggle. "I think the pet-therapy program will be really beneficial for students like me who are missing home and their pets," Miller says. "It will help them through some of these hard times." Pet-therapy programs are a new phenomenon seen in a few universities across the nation. When the idea was presented to First Cowgirl Ann Hargis last January, she recognized its potential for improving overall wellness at OSU. Hargis asked her assistant, Kendria Cost, and veterinarian Lara Sypniewski to help create the proposal for Pete's Pet Posse. President Burns Hargis approved the proposal, and an advisory board was formed. "We have developed robust programs in physical activity and nutrition," Ann Hargis says. "Now we are focusing on emotional health. Pete's Pet Posse is designed to positively impact the entire campus population." 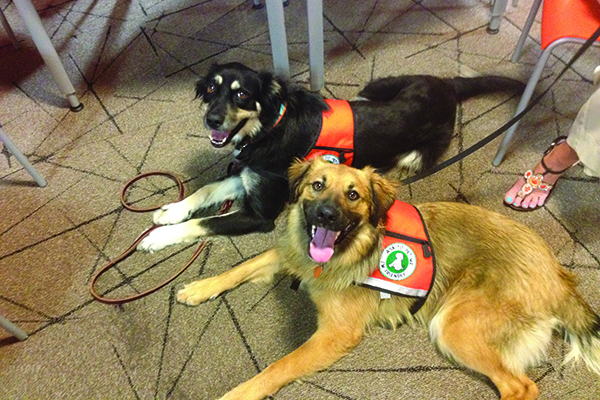 The program is in the pilot phase with two dogs in training: Evie and Charlie. 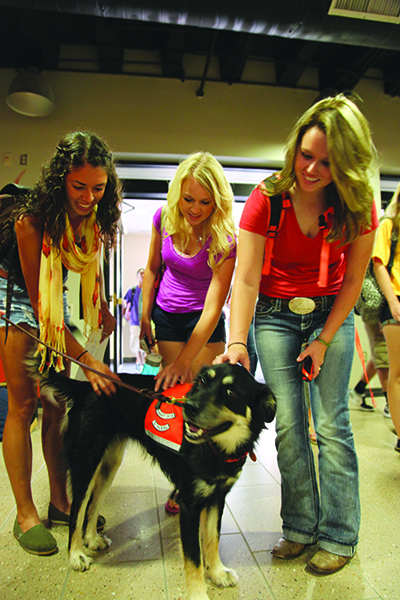 Hargis says the goal is to incorporate therapy dogs in various departments across campus, raising the morale of faculty, staff and students. Each department will determine how the dog best fits into their culture and how the animal can be most effective with the population they serve. "I have seen students change as they interact with Charlie and Evie," Hargis says. "By the same token, I have witnessed faculty and staff get on their hands and knees to interact with these animals and go back to work with a spring in their step." Evie and Charlie are the first two dogs in Pete's Pet Posse. Cost says Charlie and Evie, who trained together on campus this summer, have become popular with several departments. "Campus Life has a treat drawer for them," Cost says. "When they visit, Evie and Charlie know exactly where their drawer is." Centers for Disease Control and Prevention research shows animals can reduce stress and lower blood pressure, triglycerides and cholesterol. This adds an emotional health component to the America's Healthiest Campus campaign. "We are hopeful that Pete's Pet Posse will bring a little comfort to those dealing with a lot in their lives or those who just need a little lift," Cost says. "It is optional to participate, and you choose what you get out of it." People affiliated with OSU can apply to have their animals accepted into the program. The pets first go through a disposition evaluation and physical exam at the OSU Center for Veterinary Health Sciences. Recommendations are then made to the OSU Pet Therapy Advisory Board, and those pets accepted into the program begin training to become certified through Human Animal Link of Oklahoma. CVHS provides food, microchipping, vaccinations, heartworm preventatives, deworming and annual check-ups for the therapy dogs. "It's my job to make sure that every dog in this program is as healthy as they can be," says Sypniewski, the Henthorne Clinical Professor in Small-Animal Medicine. "We need to make sure that their owners have been committed to their wellness so that these animals can improve the wellness of people." Sypniewski says a nationwide anxiety epidemic is contributing to relationship and family problems, substance abuse, suicide and violence. A group of students pet Evie. "The addition of a therapy dog to stressful or anxiety ridden situations has the potential to reduce psychological stress," Sypniewski says. "They also build trust and improve communication with counselors." Evie's handler, Lorinda Schrammel, says Student Affairs is taking advantage of having a therapy dog on campus. "We had one student who just really didn't want to open up," says Schrammel, OSU's manager of training and development in the human resources department. "But with Evie at the session, it opened dialogue, and she helped facilitate the conversation." Therapy dogs are used in a variety of situations from counseling services to busy airports, but the impact remains the same. "If we bring a smile to one student's face; if we help one stressed co-worker take a deep breath and relax; if we keep that one person from making a poor decision — hurting themselves or hurting other people; if we just have that one impact, then it's all worth it and the program is a success," Sypniewski says. To make a donation to Pete's Pet Posse, which will help offset maintenance and training costs as well as other expenses, contact Amanda Davis, the OSU Foundation's senior director of development for the Center for Veterinary Health Sciences, at 405-385-5172 or adavis@OSUgiving.com. On the night of May 20, 2013, Evie was alone in Shawnee, Okla. Abandoned by her family days before, there was no one to take her to a shelter when a devastating tornado ripped through the area. Evie was injured, covered by thousands of ticks and infected with heartworms when she arrived at the OSU veterinary hospital. Because of generous supporters of the Animal Relief Fund, Sypniewski and her team were able to save Evie. She has been adopted into a loving home and continues recovering. Despite the difficult path she traveled, Evie's love for people and happy demeanor is infectious, which made her an ideal candidate for the pet therapy program. Evie, in true Cowboy spirit, is giving back.